"Valery Rybakov was born in 1980 in Belarus. In 2002, he graduated from the Belarusian National Technical University as an engineer technologist. Since 2001, he has worked as an artist-designer in the city of television "Intex", where he has been the development of the design of television programs. important role in the formation Rybakova as an art"
You saw the loneliness in painting? As portrayed in the paintings of artists loneliness? In my work You saw the loneliness in painting? As portrayed in the paintings of artists loneliness? In my work there is not enough oil paintings and palette knife, which have in their name the word "loneliness". Apparently this is the state of the soul of man is very familiar to me. Oil Painting: Wind plays with sea wave off the coast. Winter landscape called Winter Landscape Sunrise in winter forest. Painting: Cheerful bouquet 108. Painting flowers. Night city landscape - Walk through the night city - palette knife painting - Rybakow.com - artist Valery Rybakow. Cityscape - painting with oil and palette knife. 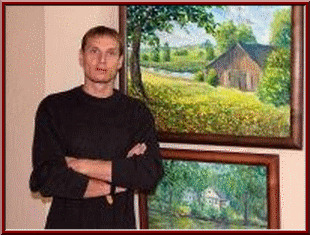 Artist Valery Rybakow. Valery Rybakow - Oil Painting: Wind plays with sea wave off the coast. Valery Rybakow - Winter Landscape Painting by Valery Rybakow, Winter Landscape Painting, Winter Landscape Painting for Sale, Winter Landscape Fine Art. Valery Rybakow - Winter landscape called Winter Landscape Sunrise in winter forest. Valery Rybakow - Flowers oil painting the Field of red poppies. Palette knife Paintings for sale. Valery Rybakow - Night Oil painting: Walk through the city Bautzen in Germany. Rybakow.com - Buy Oil paintings.